The initial shock of hearing of my Grandpa's death has worn off. Sometimes I forget how many people care about me and support me, because often I feel very isolated since I work from home and my husband Mark uses our one car to go work. During the summer I don't mind walking around to run errands or taking public transit, but during the winter, especially when it's cold and snowing, it is not pleasant! I felt numb yesterday as I let my friends know the news about my Grandpa, and let Mark's mother and sisters know, since I am very close to to them. I slept for at least 10 hours last night, and when I woke up I started to think about how blessed I am to have such an extensive support system. Some of you know that when you comment on a blog post I have written, it arrives directly in my inbox. This is because I have enabled threaded comments. If you would like to set up your comments the same way, click on blogging tips at the top of the page, and click on the link "How to enable threaded comments." The tutorial comes with a picture, which is small, but you can click on it to make it bigger. I didn't reply to most of the kind comments I received in response to yesterday's post because I was so exhausted. I did appreciate all of them and they warmed my heart. I will share with you some exciting news. For about six months I have been planning to make vintage miniature perfume bottles, soaps, perfume bottles, and vanity sets with a shabby chic theme. I have finally gathered all the materials necessary to make up these tiny treasures. I have a good tutorial as a starting off point, and my own ideas as well. My friend Pat is going to help me learn to use Resin, which I have never used before. As soon as I feel comfortable making these minis, I will have a giveaway on my blog, and I will open an Etsy shop to sell these miniatures. I am still planning to sell beauty products on Etsy and hope to be shipping to to States within a year (It's too expensive to ship Internationally). I think selling miniature beauty products and full size beauty products on Etsy will be twice as nice! And I will definitely sell my miniatures internationally. I hope you are excited about my plans as I am! 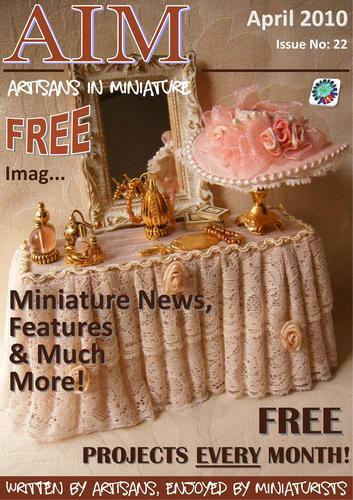 This issue of AIM magazine is entirely devoted to shabby chic! Take a look on my sidebar. Kat from Four Little Walls is having a great giveaway on her blog. Kat has a special place in my heart because she was the first miniature blogger who started following my blog :) Before then it was just two of my friends. Kat also has a lovely online store linked to her blog. 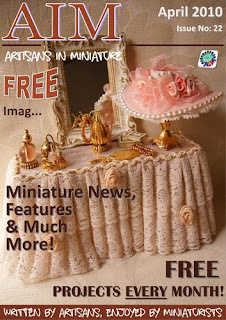 It's filled with Christmas goodies for your Christmas scenes or dollhouse. Life goes on, and I'm trying to honor my Grandpa's approach to life by living in the moment and taking big bites! My Grandpa remarried in his late 80s, was very active in volunteering, and him and his wife travelled extensively and shared many adventures before his declining health forced him to slow down about 2 years ago. So glad,you java something that makes you feel better! Thinking of you lots! Love the soap and perfume,idea!!! that's going to be a lot of fun, I've never worked with resin but I hear it's easy to do once you get the hang of it. take care Dear....Great Big Hugs to you! !